What you're getting: A triple (at minimum) with American cheese, grilled onions, bacon, ketchup-mustard-mayo, and pickles (or any of their 2,147,483,648 available burger combinations). Oh, and a side of onion rings. Let's give a hearty "huzzah" to good old alphabetical order, which allowed us to place Blimpy Burger in the "top" spot of Michigan's best burgers without bias! (Okay fine, it's actually "Krazy Jim's Blimpy Burger" and we kind of cheated... but it's known primarily as "Blimpy Burger" and, because this is Michigan and we slap an apostrophe-"s" on everything, "Blimpy's" -- deal with it). If you haven't yet heard, you don't deserve to know -- Ann Arbor's iconic Blimpy Burger, which closed down last year after the building was purchased by University of Michigan to build graduate housing, has now righteously re-opened and is once again serving you steaming piles of house-ground meat alongside salty insults, should you fail to place your order properly. Bridgewater Bank Tavern serves up half-pound patties of 100% certified Hereford beef that is always fresh/never frozen, dripping with cheese on a lightly toasted bun, with standard LTO fixins & extra-thick pickles, alongside three different options for fries (regular French, waffle, and sweet potato) and a selection of Michigan craft beers. It's the best burger in Bridgewater! 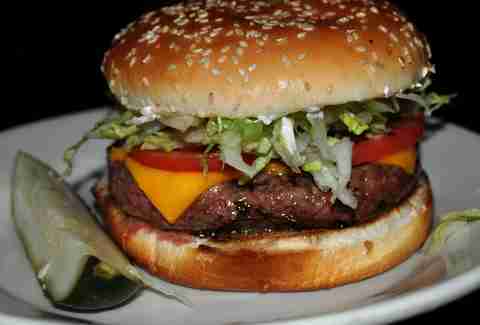 (And it would still be the best burger in Bridgewater even if it weren't the only burger in Bridgewater). It's a burger the size of your face on a (remarkably high-quality) bakery bun, dipped in butter and toasted up crispy on a grill that has been seasoned with years and years of Jameson shots and hipster sweat... and that's really everything you need to know. Some damn hippies will insist on getting the damn bean burger and still calling it a "burger", but you're in Detroit damnit, not some coastal yuppieville, so order the damn beef. And oh, say hey to Charlene! Damnit. 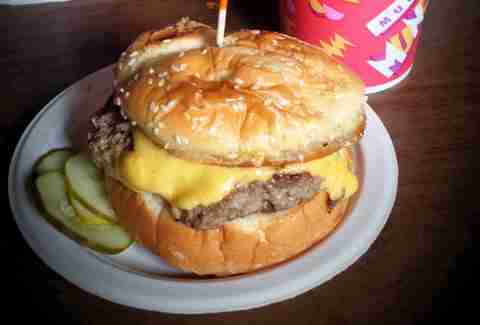 What you're getting: "The Big C"
"Clyde's Colossal Hamburger" is a slightly-less-than-colossal (in this age of Man vs. Food) triple-patty, three-quarter pounder of fresh ground beef with all of the things served at a classic drive-in on the other side of The Bridge. 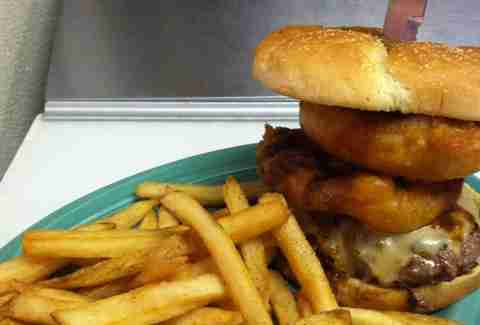 If you're feeling saucy, also try the pizza burger – it's a Yooper specialty. "What's a 'stuffed burger'?" you’re asking. It is a burger stuffed with stuff! Specifically combinations of things, including: cheddar & bacon, bleu cheese & green olives, Swiss cheese, mushrooms, grilled onions, and other such culinary delights. Take a moment to brain over that: they put the cheese IN the burger. 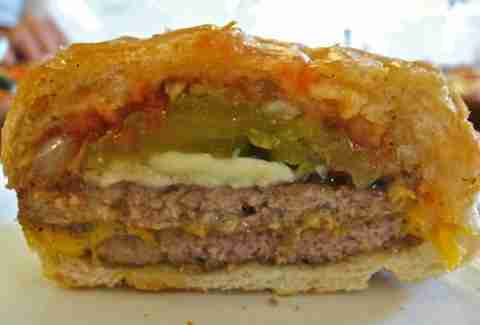 It is the burger equivalent of our Detroit-style deep dish pizza tradition of putting the toppings under the cheese. Brilliant! Also, if you're guaranteed to get a seriously fresh burger anywhere in the city of Detroit, it's going to be at Eastern Market in the Meatpacking District (where Cutter's is located). Just saying. 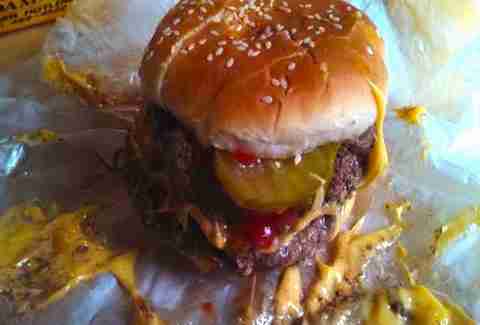 Would you like some burger to go with that hefty slab of Velveeta? ... You don't have to answer right away. 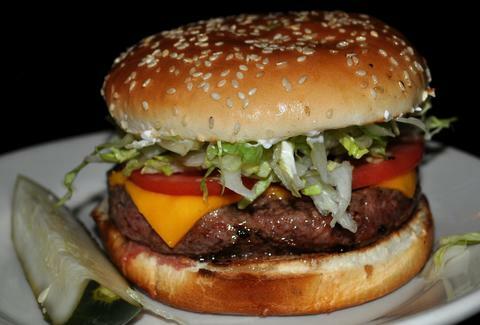 While every other burger in Dearborn tends to get overshadowed by a certain place on Michigan Ave (we'll get to it), Falls Sports Lounge deserves some serious shout-outs for their juicy patties covered in blocks of melty Velveeta and served on a perfectly firm-yet-soft, thick-yet-balanced bun. First of all, this place used to be a blind pig – a legit Prohibition bar. And not, "oh hey, check out our original stamped tin ceilings that date back to Prohibition"-bar, but a bar located in the basement of a 100-year-old farmhouse in what is now a residential neighborhood just on the outskirts of Mt Clemens that served illegal booze to patrons in secret for 13 years... -bar. The bar itself measures roughly 15x30 feet and the ceiling is so low that anyone over six feet tall has to duck. But we're here to talk about burgers, and the burger here is a thing of bliss – quite possibly the Platonic ideal of burgers. Frank (you know, the owner, who also lives upstairs in the farmhouse) goes out and buys fresh sirloin every day, and the result is a burger that the ancient Greeks would have written epic poems about. Two words: butter burger. Over in Menominee, on the westernmost edge of the Upper Peninsula in a part of Michigan that is basically Wisconsin, they put butter on their burgers, because they are a vastly more advanced society with leaders who are wise and good. 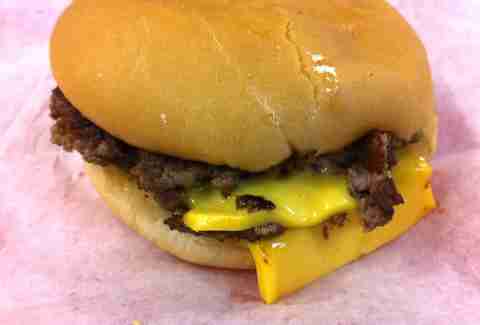 The Wabash is a flame-grilled burger with a pat of butter added on top of the patty and served on a toasty hard roll. They also have a special that includes a 10" pizza, two Wabashes, and two drinks for $12 – cheap enough to make a city slicker weep into their butter burger. What you're getting: "The Chapman"
Named "the best burger in Michigan" last year in a state-wide taste-test conducted by MLive staff, Laura's Little Burger Joint has been basking in the attention of newfound fans discovering their signature "Chapman" burger – featuring two quarter-pound patties, two slices of pepper jack cheese, bacon, and grilled onions – for the first time. Better get there quick, though – they'll close in November for the season and reopen next April. Miller's advertised "world-famous" ground-round is, in fact, actually world-famous, unlike most places that advertise their own world-famousness. 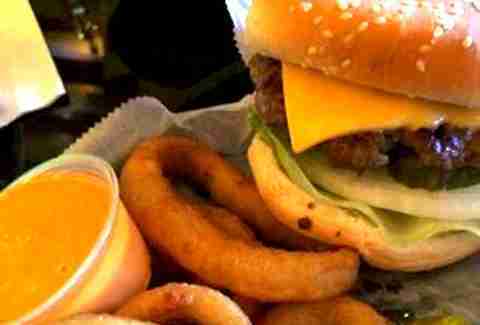 This place is a legend in the state of Michigan, named "best burger" in numerous local outlets, with plenty of national shout-outs as well. 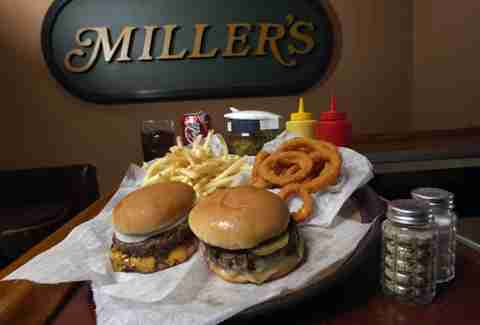 Miller's offers a thick, juicy patty, served on a white bun in wax paper (no plates) with melty cheese, ketchup, mustard, pickles, onions, and absolutely nothing else. You pay at the counter by the honor system (and with cash only). Miller's most certainly has a unique charm that has captivated customers for decades, even if there are now whispers of the "Miller's myth" from those who like to be contrarian. This SW Detroit diner has been around for ages, and just might go unnoticed if it wasn't for their legendary smashed sliders. Two griddled patties topped with oozy cheese and onions are smashed together between two buns, with the delicious griddle flavor carrying it all home. 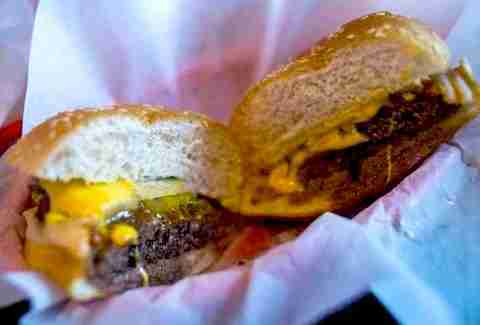 Motz's has bigger-sized burgers with an array of other topping options, too, but the old-school slider is just perfect in its simplest form. Look, you could get a single 1/3-pound patty cheeseburger and call it a day, but you would really be missing out on the full Redamak's experience. The three-patty (that adds up to one full pound, for all you math majors) triple cheeseburger oozes gooey Velveeta from its wax paper swaddling clothes, and, when dressed up with "everything", includes ketchup, mustard, crosscut dill pickles, and raw onion (lettuce and tomato on request) on a sesame seed bun. Each burger is individually cooked in a skillet, keeping them all nice and juicy without the overpowering charcoal flavor that can be the ruin of many a poor burger. Be warned – they close for the season October 19 and won't open again until spring. What you're getting: "The Original Red Coat Special"
This vaguely Euro-style tavern features a variety of British pub food like fish & chips, shepherd's pie, and Scotch eggs, but all of those are just side dishes for the burger. A half-pound of freshly-ground choice beef comes with a variety of topping options, including smoked Gouda, three different kinds of onions, guacamole, and Zip Sauce -- though the original classic is served with lettuce, tomato, mayo, and their special Red Coat sauce on a sesame bun. They also have a killer beer list that is full of boozy Belgian beers (ask for the reserve list for some extra-special goodies). The inclusion of Roast on this list will likely be a matter of debate. 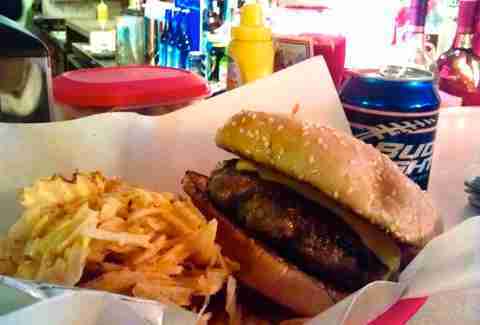 It's a damn tasty burger, and pretty much everyone would agree on that point, but does a "fancy" burger really belong on a list populated entirely by almighty dive bar and diner burgers? The answer is yes. The Roast burger – featuring bacon, cheddar, fried egg, and pickled onion, served on an English muffin, available for a scant $3 during Roast's much-lauded happy hour – was a game-changer. 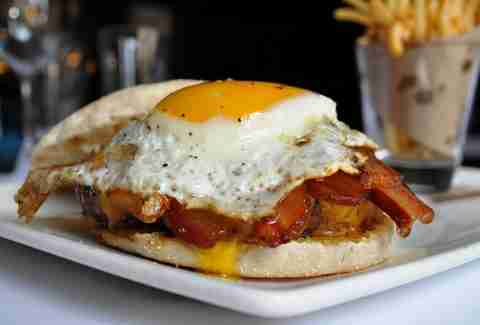 Roast's success was the first sure sign that Detroit was ready for a grown-up restaurant, and for many Detroiters, it was their first experience with fried egg on a burger. Without Roast, could there be a Green Dot Stables? A Vinsetta Garage? Thankfully, we'll never know. Roy's is a tiny diner in Milan that plays up the racing theme (what with the Milan Dragway being right there). Sit at the counter and chat it up with the guy manning the grill – who will quite possibly be owner Dave Tillman – as he cooks up your "Big One," a giant hand-pattied half-pounder topped with cheese, onion, tomato, lettuce, and mayo. 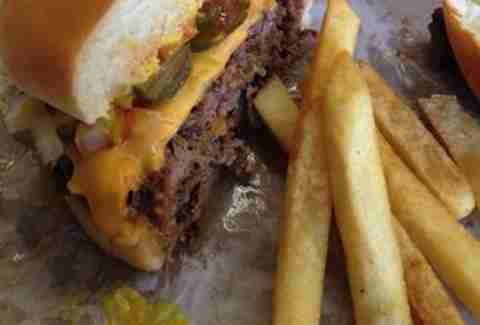 But the real secret to Roy's burgers is in the seasoning, which comes from a closely-guarded secret family recipe (and the Tillman family is a veritable Southeastern Michigan burger dynasty). 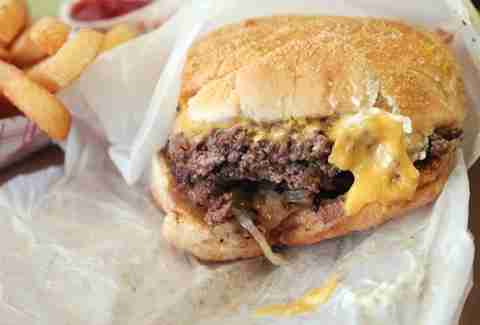 What you're getting: Double with cheese and "everything sauce"
Sidle up to one of only 15 stools around the U-shaped counter at this old-school burger joint (that dates back to 1927) and order yourself a double cheeseburger with "everything sauce." The "everything sauce" stays pretty true to its name – it's a combination of mustard, sweet relish, chopped onions, and seasoning. Meat is delivered daily and ground fresh in-house, before being cooked up and served in wax paper, already cut in half. Two slices of melted American cheese layered between the juicy, loosely-packed patties on a soft-but-plain bun make for the perfect no-frills diner burger. What you're getting: "Our Famous Handcrafted Burger"
The dynamic duo Alan Richman of GQ and Gayle King of being-friends-with-Oprah both named the handcrafted burger at Sidetrack one of the best in America. 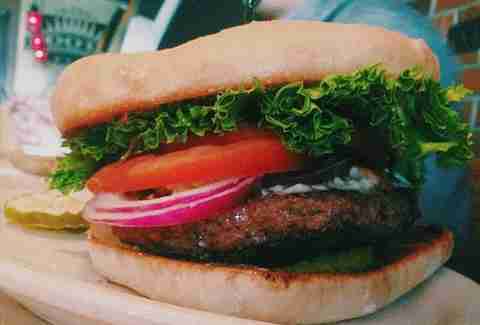 Made with a proprietary blend of beef custom-made for them by Hiller's Market, the burgers are hand-rolled and ground fresh daily. 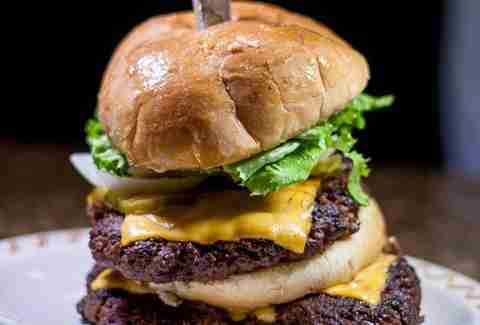 Their famous burger is a 1/3-pounder topped with two slices of cheese (options include the standards and others, like Gorgonzola and feta) and topping options like marinated portabella and fried egg. They even have gluten-free buns, even though your supposed gluten sensitivity is probably not real. What you're getting: "The Spikeburger"
Welcome to "the Meeting Place of the North" -- the historic Spike's Keg O Nails in Grayling. Spike's has been open for more than 80 years now, and the place is a northern Michigan institution. When you stop in, you have to order "The Spikeburger" – a 1/3-pound patty of ground round topped with mustard, ketchup, pickles and onion. Add extra fixins like crispy bacon strips, grilled mushrooms, chopped green olives, or a blast of heat from Arizona Gunslinger Smokin' Hot Jalapeño Pepper Sauce, with a side of sweet potato fries. 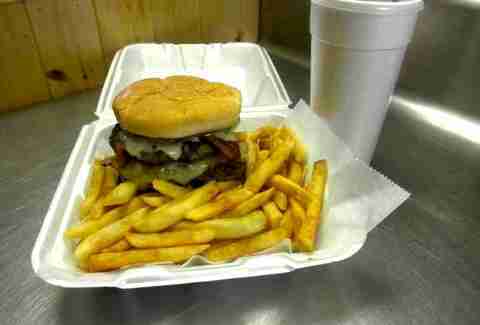 What you're getting: "Stella Blue"
In 2012, GQ named Stella's burger the best in all of America – the whole entire country. 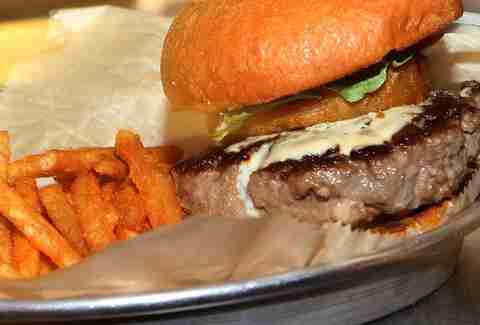 The Grand Rapids burger joint – which also happens to be a damn fine whiskey and craft beer bar – serves hand-formed patties of 100% Black Angus beef, and the best-selling "Stella Blue" is stuffed with blue cheese and bacon. If you'd like to add more flavor to the party, order the "Buffalo" – Stella Blue with Stella's signature buffalo hot wing sauce and celery-mayo added on top. And play some vintage Pac-Man and Donkey Kong arcade games while you're there. 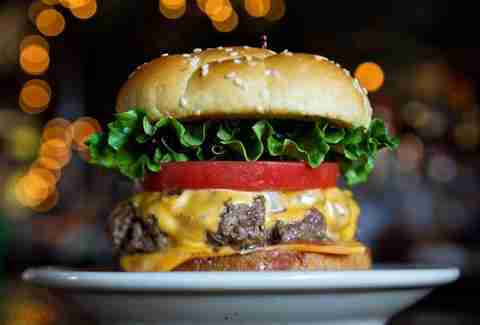 Look, sometimes there's nothing wrong with a classic, and the 1/3-pound cheeseburger at Talley's Log Cabin Bar is a classic -- a big (but not too big), juicy burger cooked on a flattop grill with melty American cheese on a toasted sesame bun. 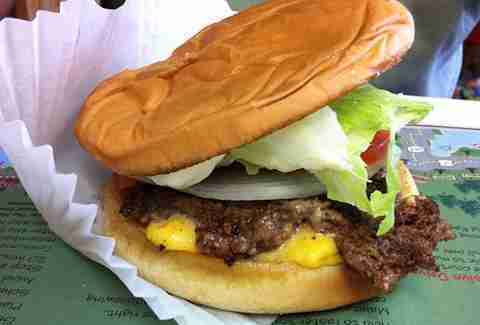 Hand-pattied burgers are made with fresh, locally-sourced meat, and it's this freshness that makes this no-frills burger one of the best in Michigan. The Torch Bar & Grill is a little bar that has been open since 1946, tucked away in an alley in downtown Flint, that you enter by way of a creepy old staircase. In short, the place has character, and its character fits Flint. The Torch Burger is a half-pounder made from ground chuck sourced locally from Abbott's Meats, served with American cheese on a sesame bun from a local bakery. Burgers are cooked on a flattop grill and served in plastic baskets, and the taps pour a rotating selection of Michigan craft beers. The Torch is an unexpected and pleasant surprise, kind of like Flint, if you give it a chance. This tiny diner seats only a handful of people and is about as bare-bones as a place can get. West Pier serves classic 1950s diner food: burgers, shakes, and a whole variety of things that can be dunked in the fryer (including Oreos for dessert). 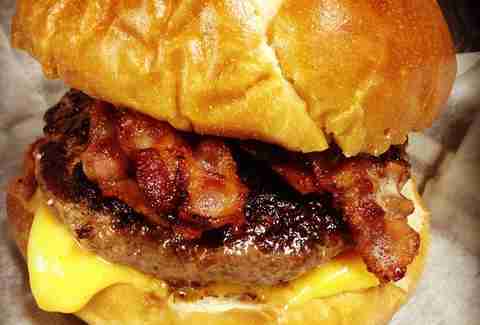 The double bacon cheeseburger is made with two half-pound patties of fresh, local ground beef cooked on a flattop grill, topped with bacon & cheese, which oozes out of the bottom of the extra-large sesame seed bun that is large enough to hold it all in. 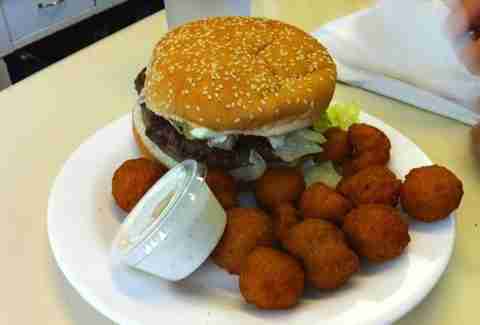 The burgers are excellent, but save room for all of the deep-fried diner delights (and a milkshake!) because all of it is worth the gluttonous calorie-guzzling.